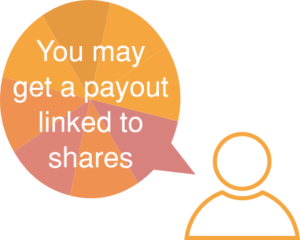 In some circumstances a company may want to put in place something that feels a lot like a share plan but in fact only ever delivers cash payments that are linked to the value of real shares. This kind of award can be called lots of different things. You may hear about ‘phantom shares’, which are rights to receive a cash payment equal to the value of a real share, or ‘phantom options’, which are rights to receive a cash payment equal to the growth in value of a real share above a particular level, which may be called the ‘notional exercise price’. You can also come across words like ‘synthetic shares’, or ‘shadow shares’ or ‘stock appreciation rights’ or ‘SARs’. The idea is basically the same in each case. What are the terms of the award? These should be set out when the award is granted. Often they will be similar to the terms of a real share award, at least as regards key dates and the circumstances in which they do or don’t pay out. There may well be employment conditions and/or performance conditions. From your point of view, a cash award should be very simple- once the award terms have been satisfied, the amount earned will probably just be paid into your bank account. How will the award be taxed? The award is just cash so it will be taxed as earnings, in the same way as normal salary or cash bonus. Income tax and employee national insurance contributions will be deducted through the Pay As You Earn system. However, in the month in which your award is paid out, you may find yourself pushed into a higher tax rate. If this means you pay too much tax, it normally gets adjusted over the rest of the tax year so that by the end of the tax year you have paid the right amount of tax. If you think you’ve paid too much, there are ways of getting HMRC to pay you back, for instance through your Self Assessment Tax Return. Sometimes a company has to settle normal share awards in cash rather than by delivering shares as originally intended. If this happens, the cash will have income tax and national insurance deducted from it through Pay As You Earn. You are granted a conditional right to receive cash. The amount of cash you get will be linked to the value of your company’s shares. Other conditions may apply as well. If the conditions are met, the cash will be paid to you, after deducting employment taxes, in the same way as tax is deducted from your normal pay. Usually the award only vests if you remain in employment during the vesting period. There may also be other conditions that have to be satisfied before your award can vest. If you need help to decide what to do with the cash, look at the Getting Advice page.